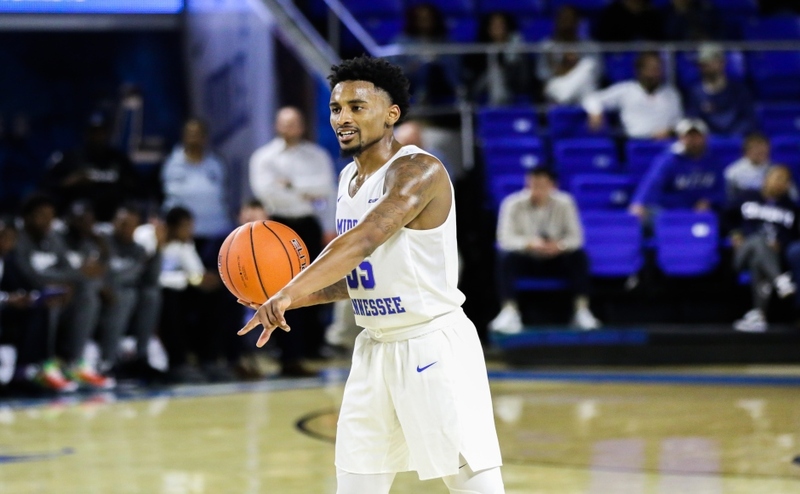 The Middle Tennessee Blue Raiders (13-5, 5-1) kicked off their tough stretch with a 73-63 loss to the Marshall Thundering Herd (13-6, 4-2) last Thursday night. 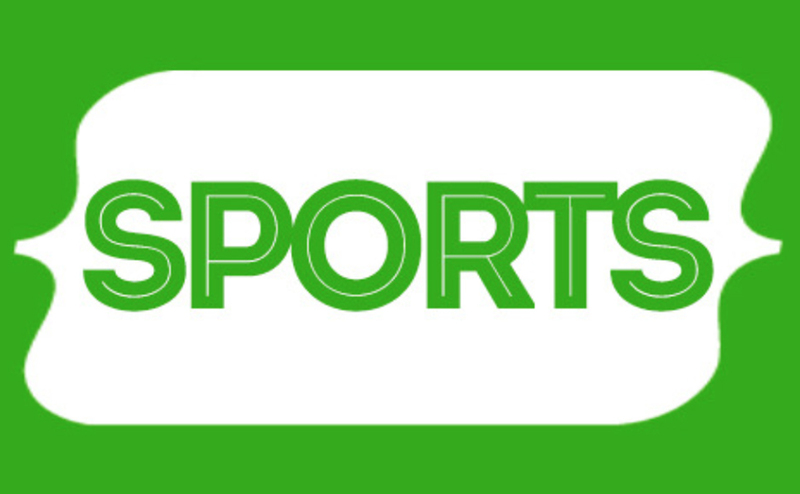 The game was expected to be a wide-open contest and featured the top scorers in C-USA with MTSU forward Nick King and Thundering Herd guard Jon Elmore. 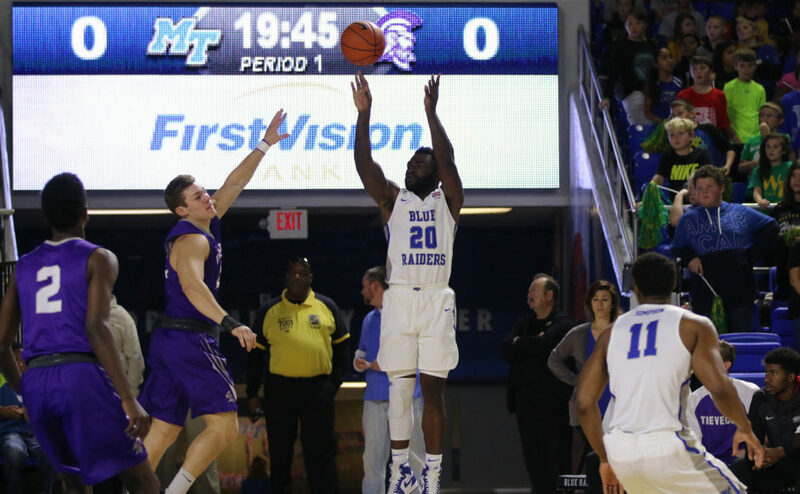 Middle Tennessee had a rough start to open the contest, and Marshall capitalized on it. Led by C.J. Burks, the Herd jumped out to an 11-5 advantage by the time the first media timeout arrived. The early lead was a direct effect of MT’s inability to hold on to the ball, as they turned it over five times within the first five minutes. Middle Tennessee eventually went on a run as all good teams do. Powered by King and Giddy Potts, the Blue Raiders tied the game and eventually took the lead at 34-33. The advantage was short-lived however, as the Herd took a 36-34 score into halftime. Out of the locker room, both teams showed that they could shoot the rock from three-point land. Potts drained a three to give MTSU a 37-36 lead. While they played better at the start, the Herd continued to get buckets from an unlikely source. Burks continued his strong start in the first half right into the second, as he hit back-to-back threes to put Marshall on top by a score of 42-39. He never ceased to be a major thorn in the Blue Raiders’ side for the rest of the game, as he finished with 25 points. After another Thundering Herd three, MT found themselves down by six after being in the lead just a few possessions earlier. Potts tried his best to keep the Blue Raiders in the fight. Trailing 55-49, he took the ball inside, absorbed some contact and finished a layup to bring MT within four with nine minutes remaining in the bout. Moments later, he nailed another three to keep the deficit at that mark. 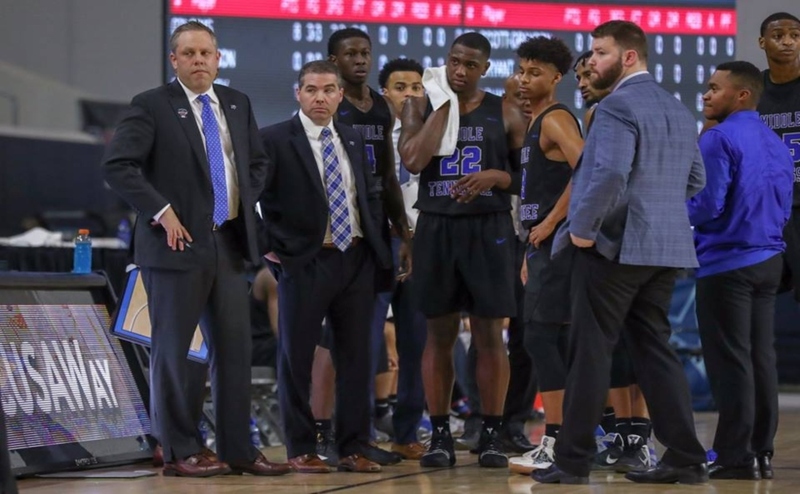 That was as close as the Blue Raiders would come however, as Marshall separated themselves in the final seven minutes and held on for an impressive 73-63 win. MT committed 19 turnovers and allowed Marshall to score a total of 18 points off of those miscues. King turned the ball over six times while guard David Simmons committed five of his own. 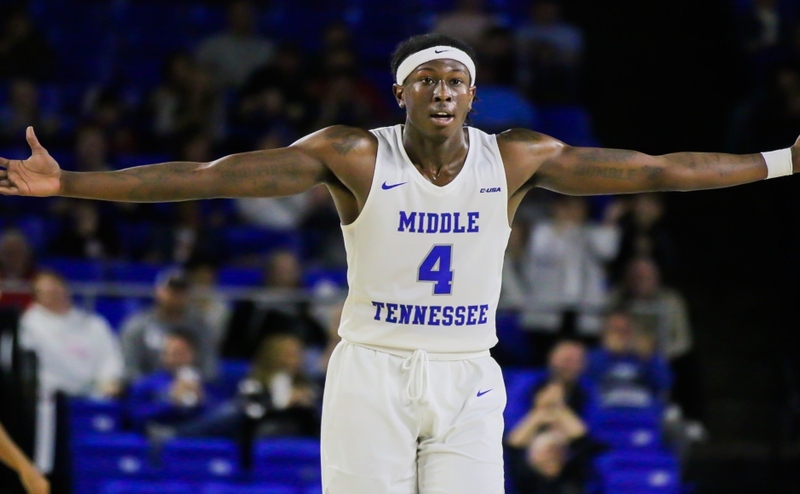 Middle Tennessee must keep their turnover numbers much lower to win another conference championship, especially with the conference being as open as it is this season. 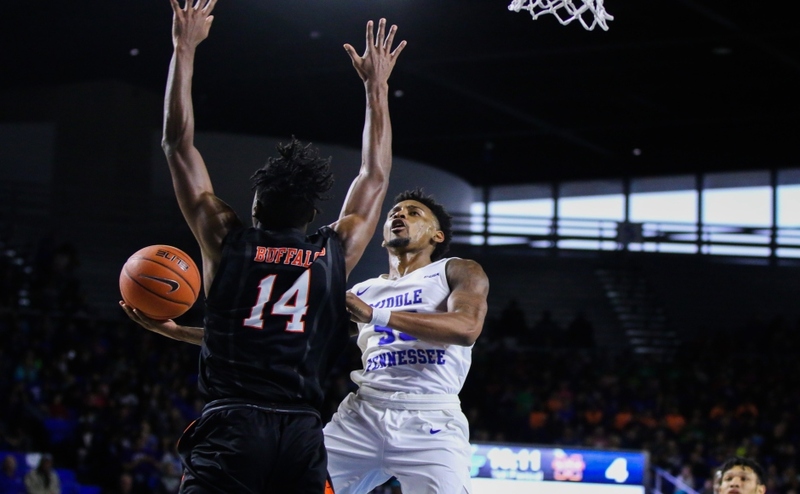 While King struggled (6-19 from the field), Potts showed why he is also a go-to guy for Middle Tennessee. He finished the game with 15 points and seven boards. He also showed his durability playing all 40 minutes. While he’s second on the team in scoring, Potts proved he is still more than capable of being the lead guy. If King has anymore games similar to this one, Potts will need to take over in order for the Blue Raiders to continue winning. To say the Thundering Herd shot the lights out would be no exaggeration. Marshall shot 46 percent from the field and 44 percent from behind the arc. Though he’s not the leading scorer, Burks controlled the game by scoring 25 points on 9-16 from the floor and 5-8 from beyond the arc. With MT not shooting the ball well from behind the arc in this battle, their defense needed to step up, but they just couldn’t get the necessary stops down the stretch. The basketball edition of the “100 Miles of Hate” rivalry will be on display at Western Kentucky in front of a sold-out crowd at 6 p.m. on Saturday. The WKU Hilltoppers come into this game in first place in C-USA after an impressive win over UAB. This one is a huge game for both teams, and it’ll definitely be a major factor once March comes and the conference tournament rolls around.